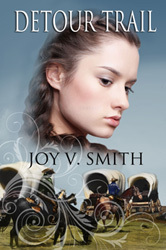 Detour Trail: After being dumped by the wagon master of the train she and her murdered uncle were traveling with, Lorrie Emerson must form her own wagon train; she recruits those needing her help–a brother and sister, a family, and a couple of escaping slaves. Lorrie and her party slog through mud and mountain passes before taking a detour. Because the family desperately needed help, Lorrie must leave the trail with her small group of wagons, fighting off thieves, storms, and ambushes along the way. Finding supplies isn’t easy either, especially during blizzards. However, she makes friends along the way, and Jake, the heroic mule, joins her train too. Later, Lorrie rescues Barrett Lee. After this man from the wilderness recovers, he and Gray Cloud the wolf leave–with a push from her. Will he return? Will these two independent people make room for each other in their lives? And would he let her keep her independence as she continues to take on more adventures? 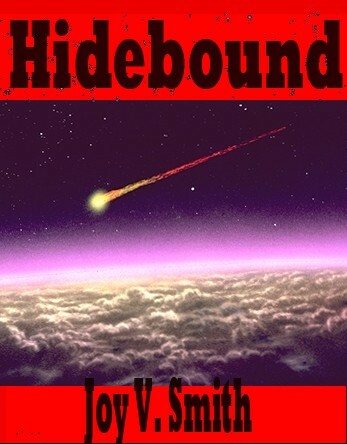 Hidebound is a “reprint” of one of my science fiction novellas; it’s an adventure romance with some adult content. Hidebound has a double meaning; it refers to the hero’s body and culture. Anfissa is escaping from her home planet on a family member’s ship so she’s safe from peril and a worried mother who wants to keep her safe. Anfissa is rebellious, but not stupid. After Anfissa meets Ferenc, a dangerous , but intriguing humanoid in the employ of a hunted criminal, she’s kidnapped by his employer when the space ship they’re on is attacked by the employer’s enemy. They flee to a planet where even the grass is deadly; then there are the plants, including carnivorous bushes. Another interesting plant is the snakelike one with a long yellow head. It has a pale yellow, narrow bell-like flower on a long, waving stalk with five broad, yellow-green leaves lying in a circle around it on the ground. (The leaves are flat unless it’s feeding and they fill up.) At one time, I thought that the book cover would be really effective if the the flower/head were looking out of the cover towards the reader–with just a hint of eyes and possibly an open mouth. However, not having an artist I could afford experiment until they came up with a cover I thought would be perfect, I went with the spaceship curving down towards the planet, Snakebite, that their shuttle crashed on. On their trek across Snakebite to the relay station fortress, they find a sea of caustic plants, attacking insects, and vicious grass. With no water and meager rations, Ferenc offers her “water” from his internal supply. This is foreplay on his planet. Ferenc’s unique abilities (there’s a reason his planet is restricted) make him a valuable commodity, and Anfissa must fight to keep him safe.She must take steps to protect Ferenc before they’re separated, and she ends up at her family’s fortress, where she must protect herself and her family. Will Fissa and Ferenc have a future together? What about the rest of the family? And poor Freki?. Hidebound (SF adventure and romance) on sale!